We have learnt about various aspects of the Tudors, including Henry VII and how he claimed the throne. We have also looked at in great depth the life of Henry VIII, his many wives and his children who succeeded him. Through this topic we were able to consolidate some of the Maths skills taught this year, such as division and multiplication, working with money and calculating durations of time. In Language, we have been using our skimming and scanning skills in order to read, comprehend and answer questions from a variety of texts about the Tudors, whilst at the same time expanding our knowledge of the topic. 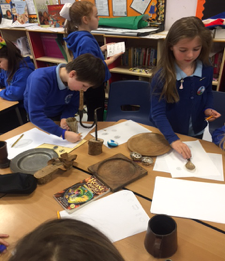 We also imagined what it would be like to walk down a Tudor street, using all of our senses to describe the scene. By combining our knowledge of the topic and the skills learnt in our Language classes, we were able to write our own persuasive advert for a Tudor home. We have also been able to tie our topic nicely into our PE sessions. The children have had lots of fun learning various Tudor dances that were popular during the reign of Henry VIII, and at the same time listening to popular pieces of music, comparing sound and style to the music we listen to today. Once the children had mastered the basic steps, they then worked in groups to compose their own Tudor dance. They performed their routine to the rest of the class, who peer assessed the dance and suggested improvements, as well as areas they felt they had succeeded in.